Many people complain about having to use social media, or the pressure of having to use social media for business because it’s difficult. But a lot of them don’t actually know why they are using it in the first place. Now it’s not like the way you may use it personally. This is not just to make friends and to make idle chit chat, it is a marketing tool. However, it is not the purpose of social media to actually do your selling. It is to build a relationship with both your potential customers and your customers. Let’s not forget them, let’s not take them for granted, once they become customers you have got to build a relationship until they become a preacher, and then they fill in the perpetual sales cycle, which is by the way a new name for our process. Thanks to Adam and Adam for coming up with the right name. Social media includes Twitter, Facebook, Pinterest, Instagram, Tumblr, a lot of people include the blog and YouTube and everything else like Google Plus — you name it. If you’ve read anything online recently, now you have got Periscope and Meerkat, among many others. 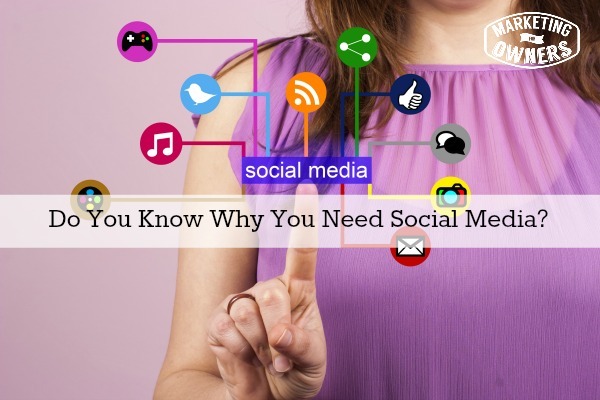 You do not need to use every single social media tool out there. However, I would advise you to grab your name up on each tool. So for instance if you are called ‘Marketing for Owners’ (like us), you might find variances like ‘We are Marketing for Owners’ on many of those social media things if you search for us. In some of them there is a limit on how many characters you can have, like in Twitter, we are just @MarketingOwners. Grab your name, put up a profile, put a link back to your website so if people want to know who you are, if they find you there, they can at least come back to your website. Even if you don’t use that social media handle, put up a couple of blog posts anyway so that if they land there, they can find you easily. You want them to be able to find you. That is the smart way of using social media, and then it makes sense, it doesn’t look like you haven’t done anything for ages. Pick your platform, and remember this is using it for work; so you need to inform people what you are up to, what good information you have. You need to find and curate other people’s information, and help your audience out with that too; and then you become a resource, you become an authority, you become an expert and a source of great information. There are people who come along and rely on you for information that they will pass to their followers. But when it comes down to it, social media is the channel to build those relationships and then bring them back to your main presence, your website, or your blog. Social media is not the be-all and end-all, it is not where you are going to do your selling, it’s where you are going to build relationships, you are going to find people and you are going to pull them in. That does not mean every single post says “Look at our link,” “Look at our new,” “Come and visit our,” “Click here to see our full bargain,” it is not about you, it is about them. So for every hundred tweets, you probably have only got five to ten that are self promotional, and even then, they are vaguely self promotional, not all out. Remember, what would someone think when you put out one single post on Facebook, or Twitter, or whatever it is, what would someone think if that was the very first post they ever saw of yours? Don’t think that everyone has seen everything else that you have put out and this is the first one with an offer. What would they think if they saw that offer? Remember that. Anyway, use social media, use it wisely, but use it to bring them back to your website, because that is where you are going to capture their information, and then you are going to start to nurture that lead. You are going to convert that lead and convert them into a purchaser. Today we are going to go off with a new one. 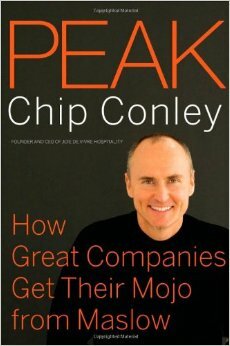 Well it’s new to you, it’s not new to the guy who wrote it, it’s called ‘Peak’ and it’s written by Chip Conley. Chip Conley ran a hotel chain called ‘Joie de Vivre’ (it’s in America). I think he has since sold it, and made a bundle of cash. But he competed in a very, very tight market, the hotel market on the West Coast, more of a boutique-y thing. The book explains how he motivated staff, how he motivated customers, how he found his niche, how he differentiated himself from everyone around, how he operated in a very common environment by making those little differences. Customers and staff loved them, loved working there, loved coming there, always, always made a beeline for it. Go pick it out, Amazon, Book Depository, where audible, wherever you listen to or read your books, Peak was great, I loved it, you will love it, try it. Which Social Media Account is your strongest?